The tactical employment of demeaning stereotypes has always been popular in the Australian political discourse. Just lump together some universally loathed behaviours – like vanity, self-indulgence or entitlement – dress them as communities you’re trying to discredit, and parade them like carnival villains. “Union thugs”, anybody? “Feminazis”? “People smugglers”? “Asylum seekers”? Conforming to the stereotype of the inner-city Melbourne lefty is exhausting. For a start, my latte bills are enormous. My carpets are always in crisis because sipping chardonnay is messy business – especially when one is multi-tasking with basket-weaving; raffia everywhere. Stereotypes are most useful when employed between communities that are not likely to have cultural or geographical contact with one another. In Australia nowhere has this been more apparent than in the mutual demonisation of inner-city types and those on the land. A sheep-farming friend of mine sent me this video recently with absolute conviction that its depiction of hateful, stupid inner-city uni students, protesting nothing, was accurate. Similarly, I’ve been told more than once that mentioning you’re a lefty in a rural community is a declaration that requires a bulletproof vest. The stereotypes feed themselves; if you think a “greenie” is out to destroy your livelihood, you are probably going to treat them with hostility. If you think someone in a rural community wants to kill you, you’re probably not going to pop around for tea. The mutual derision fomented between these communities has been convenient for political stakeholders in Australia for some time. 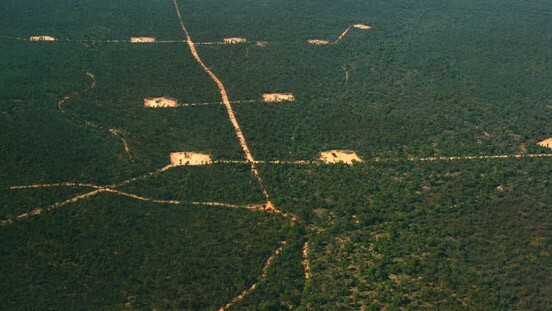 Stopping farmers and people concerned about the environment from discovering shared values and pooling campaign resources enables corporations to pursue destructive projects, like coal seam gas (CSG) fracking, with only weak, disunited objections where there should be bellowing opposition. It’s enabled lazy policy from all major parties, too – writing off the experience of farmers and/or the expertise of “greens” allows for one-eyed policy “solutions” that play merely to confected electoral prejudices, rather than fact-based appraisals of what a community needs. It’s enabled lazy campaigning, too, as candidates parachuted into safe electorates rely not on local values or persuasive visions of nation-building, but the incitement of old fears of stereotyped boogie monsters to retain votes. Things, however, are changing in Australia – and the 2013 election could indeed prove a watershed moment. I conjecture that it’s due to two concurring phenomena: the flowering of social media on the internet, and the role of rural independents Rob Oakeshott and Tony Windsor in the hung parliament of 2010-13. The first battleground of this great change appears to be the campaign in the seat of Indi, northern Victoria, between blue-ribbon Liberal incumbent Sophie Mirabella and the explosively popular local independent, Cathy McGowan. Indi is one of the 75 original seats of the Australian federation of 1901 and is as traditionally conservative as it gets. It was last won by Labor in 1928, when the conservative candidate failed to lodge his nomination. The conservatives have held Indi ever since and in 2001 they parachuted in Melbourne University Liberal Club activist Sophie Mirabella (then Panopoulos) as their candidate. She won 40% of the primary vote and took the seat without actually living in the electorate. Since 2001, Sophie Mirabella has relied on the safety of Indi to pursue a parliamentary career remarkable for her pursuit of confrontation. She’s had numerous ejections from the house for unparliamentary behaviour and been criticised for comparing Julia Gillard to deposed Libyan dictator Moammar Khaddafi and saying her own comrade Senator Bill Heffernan needed “to pop (his) Alzheimer’s pills”. YouTube footage of her recoiling from distressed left-wing activist Simon Sheikh when he was taken ill on ABC TV’s Q & A program, went viral. Mirabella’s primary vote has declined over the course of the past three elections, a massive 11%. But she still retained Indi with a near 20% two-party-preferred majority over Labor in 2010. Perhaps it’s because of her caustic antics that her popularity has declined; the internet has brought a whole generation of political bad behaviour to public scrutiny. Perhaps, the kind of politics Mirabella has taken to Canberra has left at least one in six of her old voters behind. Mirabella has continued to occupy herself with traditional urban Young Liberal causes in parliament – she was a passionate advocate of voluntary student unionism under John Howard and remains a standard-bearer for cuts to government services with tax breaks for the wealthy. Back in Indi, people in her electorate have more pressing concerns than neo-liberal utopian ideals. Indi is a seat of a lot of scattered, not always easily accessible, towns of all sizes. Traditional rural concerns exist alongside tourism communities in the Victorian Alps. Accessible health care is a big issue. Regional economic development is important. Social services have unique demands, particularly for people living with disabilities and needing aged care in isolated areas. Educational and training opportunities are vital for communities weathering the vagaries of seasonal industries in a globalised economy vulnerable to climate change. Feral pest control is necessary, and a practical and ethical minefield. Climate change is a dangerous threat, the National Broadband Network an immense opportunity. That I – as the beret-wearing, goji-berry-guzzling urban arts worker – have learned these things about Indi is evidence of how the old stereotypes of country versus city are being eroded in the new digital community, and shows specifically how the Australian political conversation has shifted to social media. 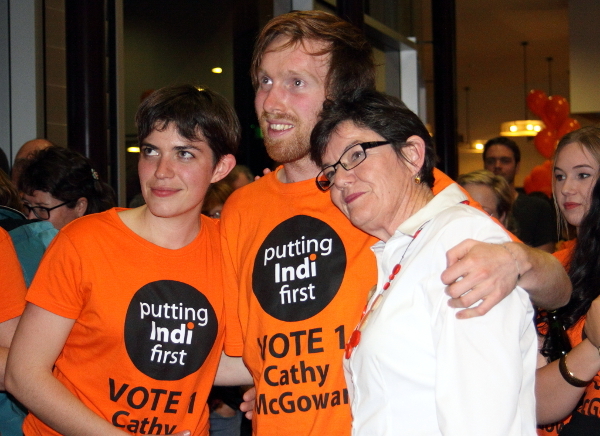 That many more people in Indi know they are not alone in their concerns about a disconnect between their community and their parliamentary representative is a phenomenon of our new political age – and its result is the powerhouse campaign of local independent Cathy McGowan. I first heard of Cathy McGowan through a media appearance by the independent MP Tony Windsor earlier this year. When neither major party managed to secure a majority in the election of 2010, I was one of thousands of Shiraz-stained progressives clutching their Pilates balls with anxiety that the fate of emissions trading and school funding were being left in the hands of Windsor and Rob Oakeshott. Stereotypes of country politicians had me convinced, without evidence, both must be gay-hating loons who believed in tying women to cows, eating endangered trees and allowing babies to hunt with Kalashnikovs. When the two gave qualified support to a Gillard-led Labor government, I was surprised – not about what that said about their faith in Gillard to do deals and carry them out – but about how wrong my stereotypes had been about what it meant for a rural independent to truly represent their community. Yes, they were ideologically conservative – but they negotiated their ideological alignments in the context of bringing local issues to national consciousness and, very practically, using the leverage of minority government to deliver tangible local outcomes. Like many Australians outside their electorates, I owe an enormous debt to Oakeshott and Windsor for educating me on the needs and concerns of their rural electorates. With both retiring at this election, it struck me that the policy conversation their independence enabled between their communities and the rest of Australia may be at an end. I yearned for more rural independents in government, because as untrue as it is that all country people hate latte, it’s also untrue that city people don’t care about what happens on the land. A few weeks ago Windsor mentioned on Insiders his support of an unnamed independent who was running against Sophie Mirabella, his “least favourite” member of the parliament. The man’s word was enough for me to seek her out. I found Cathy McGowan pretty quickly, I examined her website and read her CV – impressed from the outset at her history in community organisations, her passion for her community, her Order of Australia (ooh!). I fired off a list of questions to her campaign office, and when the answers returned were more than satisfactory, I set about using Twitter to call for donations. The miracle of the internet is the communities it brings together. A glib “why not give five bucks to the independent who’s taking on Mirabella?” tweet was shared by hundreds of people, not because I’m particularly influential but because the sentiments aroused by Mirabella’s public nastiness and Tony Windsor’s niceness were already shared by the friends I’ve made in my digital community. As the internet continues to tear down the boundaries between old and new media, old and new politics, so it has torn down the old separations between electoral communities, the city and the country. The momentum gained by the McGowan campaign is a lesson for all believers in Australian democracy to have faith in a potential new era of enfranchisement and participation. Cathy McGowan’s campaign began on the ground with “kitchen table conversations” – electorally interested, non-aligned folk from Indi organising through the internet and phones to just meet up with friends and talk about the political future of the electorate. As a community formed, they sought a representative of their shared values and found Cathy – already well known as a local community advocate and spokesperson. Originally, all they wanted was to make a safe seat marginal so their sitting member would pay more attention to issues at home. Months later, those original kitchen-tablers have brought a political will and an organisational base to a campaign that Mirabella’s people rightly fear “outguns” their own. Since a call-out for donations, Cathy McGowan’s campaign has raised $100,000 from crowd-funding, with a quarter coming from outside the electorate, from people like me who just want to see the true local win. Sophie Mirabella has had visits from Joe Hockey and Barnaby Joyce. 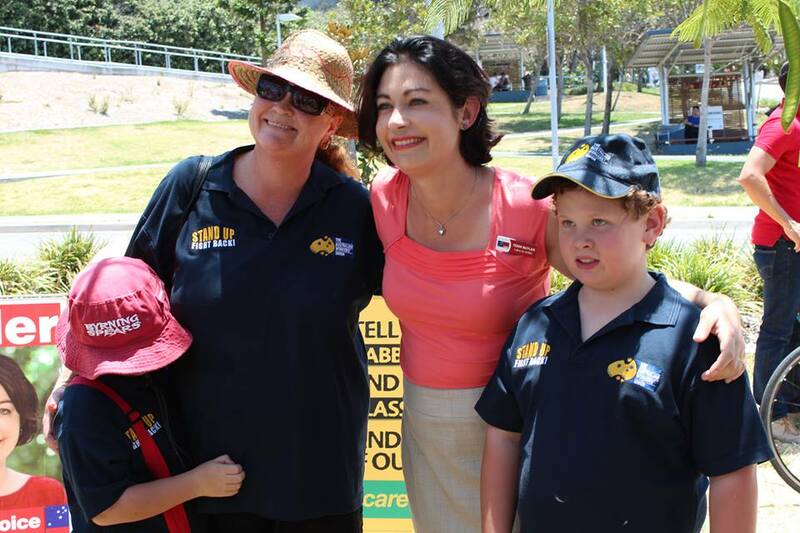 But there were eight times as many people at McGowan’s campaign launch than there were at the Liberal incumbent’s. But enough of this – I’m off for my latte. What percentage of Australian voters are actually on social media like Twitter? Is there a risk in overstating its significance? 12 million on facebook and about 3 million on Twitter. Twitter is Facebook for adults. Not to be ignored, as most pollies do their own tweets, and would soon be ignored online if they didn’t acknowledge when a helper posted on their behalf – usually due to overload! As a Greek, I am so glad that she married an Italian… we disown her! And if it took her to convince Mr Rabbitt of the contribution ethnics have made to this country – yet still reject multiculturalism in favour of assimilation – then he’s still only a couple of decades behind fossils like Fraser, then we’re in trouble.